I am unfortunately unable to blog at all myself while in Colombia, but I am very fortunate to have received this fantastic guest post on last month’s provincial elections in the Netherlands from an avid reader of this blog, ‘nimh’, who blogs at observationalism.com and tweets as @almodozo. Thanks for your work! Time permitting, I’d like to do some blogging myself, notably a belated look at last month’s French departmental elections, and other elections down the road in Canada and the UK. But I wouldn’t count on it! 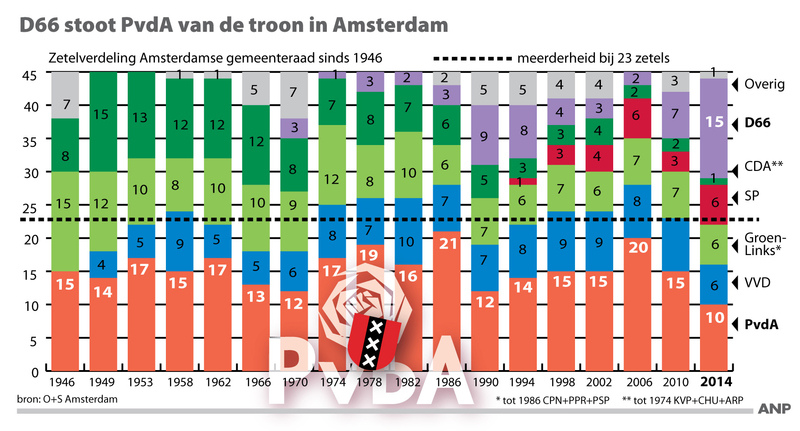 Because of the continuing collapse of the Labour Party (Dutch acronym: PvdA), the results also constituted the worst performance for the left overall in provincial elections since 1994, while centrist parties — the Democrats ’66, a party for the elderly and various regional lists — did well. 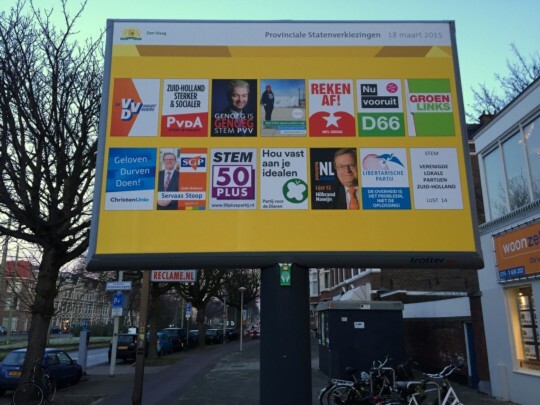 Provincial elections don’t make for the most popular ballot in the Netherlands. Turnout in the last national elections was 74.6%; in last year’s municipal elections it was 54.0%; but in these provincial elections just 47.8% of voters cast their ballot. Only the European elections are less popular — last year turnout in those was 37.3%. It’s not that the issues provincial legislatures deal with are unimportant: especially in a densely populated, waterlogged environment like the Netherlands, their decisive influence on urban planning, environmental protection, energy policy, transport and water management is crucial; but admittedly not particularly exciting. The largely consensual policy making processes at provincial level also preclude the kind of heated ideological antagonisms that will bring out the troops. But there is another reason why the provincial elections are very important — especially so right now. That’s because the provincial legislatures in turn elect the members of the national Senate (“Eerste Kamer”). The Senate’s role is to scrutinize laws adopted in the main chamber of parliament (“Tweede Kamer”) before they are implemented, and although it doesn’t reject laws often, when it does it tends to cause a ruckus. More than one government has been brought to the edge of collapse when a key piece of legislation stranded in the Senate. The make-up of the Senate is particularly salient right now. The current government, a coalition of the business- and market-friendly liberals of the VVD and the center-left Labour Party, does not have a majority in the Senate; their parties control just 30 of 75 seats. From the start, major parts of the government coalition agreement were shot down by the Senate, for example expansive pension reforms and a far-reaching plan to introduce income-dependent health care insurance premiums. To avoid running into one crisis after another, the government parties conducted regular talks with opposition parties, and there are plenty of them. A total of twelve parties are represented in the Senate, and the two government parties eventually arrived at a formal deal with three opposition parties (the so-called “C3”). These three — the centrist Democrats 66 (D66) and two small socially conservative protestant parties, the Christian Union and the SGP — provide “constructive” support in the Senate for the coalition’s extensive labour market, education and health care reforms and the deep budget cuts it pursues in the name of austerity. Having them on board creates a majority of exactly one: 38 to 37 seats. When relying on such a narrow margin, it’s no surprise that things fall apart ever so often. A government proposal to cut pensions for elderly people who move in with their children was shot down by the small christian parties. A housing law that will significantly raise rents for many people almost stranded when one rebellious Labour Senator who threatened to vote against was only assuaged in time for a midnight vote. The government and “constructive opposition” parties therefore looked with trepidation to these new provincial elections, which were set to change the numbers once more. Polling had long made it clear that the two government parties would suffer heavy losses. But would the C3 parties — in particular D66 — expand their support sufficiently to compensate for those losses and secure a continued razor-edge margin in the Senate? Because of the complex indirect election of the Senate, that question remains open; only in May will the newly inaugurated provincial legislators elect the new Senators. But it’s not looking good for the government and its partners. The five parties by themselves are not projected to get over 36 Senate seats. Even though a motley collection of regional interest parties are busily being recruited to help elect government-friendly Senators, the election result makes it almost certain that the government will have to seek agreements with further opposition parties, for example the Christian-Democratic Appeal (CDA) or the Green Left, to pass any further contentious policies. The traditional election night debate, in which the leaders of the main parties sit around a table in the TV studio to collectively evaluate the election results — a Dutch oddity, perhaps — revolved entirely around this question: who would join with whom at what price? Before we get to that, though, let’s back up the truck. What does Dutch politics look like? Most of all, the election result was marked by an unprecedented fragmentation of the political party landscape. Not a single party received over 16% of the vote. Never before was the largest party this small. 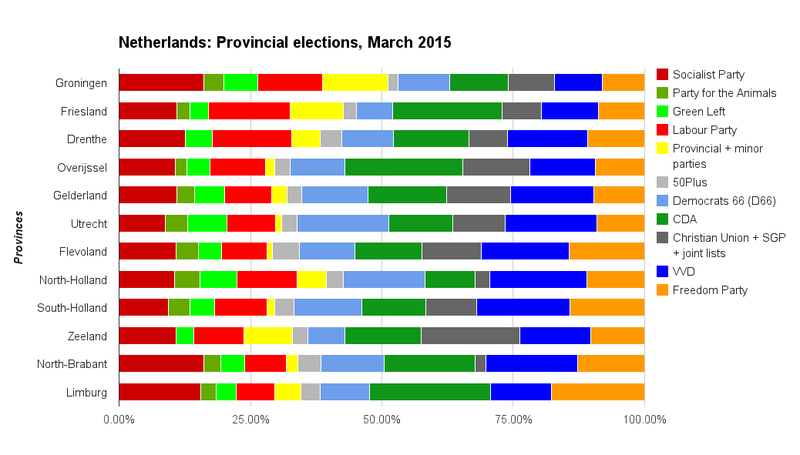 Detailed overall results of the provincial elections. Source: Sum of official results by province. In the end, Prime Minister Rutte’s VVD succeeded in edging out the oppositional CDA, but only just, by 15.9% to 14.7%. At one moment on election night, when it seemed the CDA was slightly ahead, Rutte somewhat cheekily remarked that “there’s no country in the world where the largest party is so small”. That must at least be close to true. The only equivalent I can think of in recent European elections was when elections for the Polish Sejm in 1991 saw no party get more than 12% of the vote, but then the Sejm had a tradition to uphold. The Economist wittily headlined its report on the elections “Dutch voters punish their two governing parties by voting for the 10 other ones”. There is something to that: other than Labour and the VVD, the only party to lose ground since the last provincial elections was the Green Left. Everyone else enjoyed gains. This somewhat bewildering fragmentation in election results is fairly new. The Dutch parliament always lent itself well to the representation of small parties, since there is no electoral threshold and MPs are elected on national lists rather than in individual constituencies. A seat is secured by getting as little as 0.67% of the national vote. There has been a corresponding multitude of parliamentary parties. But only a few of them stood out: the christian-democratic party (at least since three christian parties merged in the mid-1970s), the Labour Party, and the VVD, as main liberal party. Last month’s provincial election results in detailed historical perspective. The Socialist Party (SP) is in dark red, the Labour Party in bright red, the centrist D66 party in light blue, the christian-democrats in dark green, the right-wing liberal VVD in dark blue, and the Freedom Party in orange-brown. Data sourced from verkiezingsuitslagen.nl, the offical state election results portal, with added detail derived from the painstakingly comprehensive nlverkiezingen.com. When I grew up, people voted overwhelmingly for one of those three parties. D66 existed but was mostly a minor party which enjojyed occasional surges, and any other parties that got parliamentary representation were colloquially grouped together as “the small left” or “the small right”. In 1981, the three main parties occupied 68 of the 75 Senate seats. In the past four years they had 41. Now they’re set to get 33. The Dutch case is especially confusing because, while voters have turned against the government, they have not actually turned to the right or left. Since 2012 the Netherlands has been ruled by a grand coalition of the centre-right Liberals and the centre-left Labour Party. [..] Because the government is centrist, opposition to its policies has scattered voters in every direction. I’m not too sure about this; I think the results of these elections indicated an actual ideological shift as well — to the right. At the same time, when looking at the broader evolution of the political landcape over the past several election cycles, they at least confirmed how centrifugal forces have pulled voters away from the mainstream, centrist parties, but that will come up further down in this post. First, let’s focus on the evidence of a right-ward shift. When Socialist Party leader Emile Roemer boasted on election night that his party was “now definitely the largest on the left,” that may have been true, but that still only made it the fifth-largest party, behind not just the VVD and Christian-Democrats, but also D66 and the far-right Freedom Party. The Labour Party’s Lodewijk Asscher pointed out that “if you see the state of the left in the Netherlands now, there’s no reason for cheers,” and it’s hard to argue with that. Together, the Socialists, Labour, the Green Left, the Party for the Animals (yes, there is a Party for the Animals, and it has seats in parliament) and a few tiny left-wing parties that are only active regionally pooled just under 31% of the vote. That’s the lowest such share in provincial elections since 1995, and lower than any national election result since 2002, which was sui generis. For the Labour Party, specifically, this was a horrendous election result. The 10.1% of the vote it managed to pull (which, hard to believe as it is, meant actually slightly outperforming the polls) was the smallest share of the vote it has ever gotten in provincial elections. Just like last year’s municipal elections saw the party get the worst result it had ever gotten in those. The party’s fall from grace has been a long time in coming, as the party has been on a trendline of decline since the mid-1980s when it still habitually got a third of the votes. At the same time it still arrived quite suddenly, as the party was momentarily resurgent in national elections just three years ago, when it rebounded to 25% of the vote. The Labour Party is in an impossible strategic situation: it suffers an exodus of voters to both D66 and the [Socialist Party (SP)], but those voters, demographically, are each other’s opposites and are leaving the Labour Party for opposite reasons. The voters who have headed, and keep heading, to the SP feel that the Labour Party has lost its left-wing soul. They tend to be gloomy about the country’s economy as well as their own financial perspectives, look to the government to shore up the social protections of the welfare state, and be angry that the Labour Party is instead “selling out” to the VVD, to big business, to the EU. But the voters which are deserting the party for D66 are fairly optimistic about the economy and their own perspective, warmly favour EU integration, and might only be afraid of the country “missing the boat” by not demonstrating enough dynamism and adaptability. [..] The net result is that any move the Labour Party might make to win back the voters on one side will likely just further increase its bleeding on the other side. Like now, the weak result for the left in 1991 and 1994 were coupled with particularly strong results for D66 (about 15.5% then, 12.5% now). 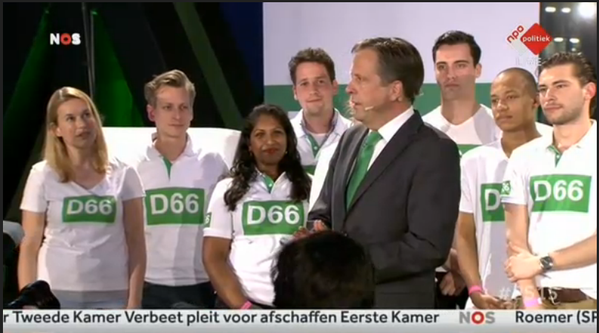 But today’s D66 is quite a different party from what it was like back then. Traditionally, D66 is a center-left party of social liberals, which strongly emphasized good governance and democratic reforms like introducing referenda, an elected Prime Minister, elected mayors, and a district-based electoral system. The party was instrumental in pushing through major legislative changes that better reflected the country’s secular character, for example on gay marriage and euthanasia but also Sunday shopping. In terms of socio-economic policy, it distanced itself from what it saw as social-democracy’s overly dirigistic tendencies, but generally steered a left-liberal course comparable to, for example, that of Britain’s Liberals and SDP. But the party has shifted rightward significantly over the past fifteen years, notably propping up a right-wing government in 2003–2006. It now presents itself primarily as a champion of (neoliberal) economic reforms. Labour is a different party from what it used to be as well. Back when its then-leader Wim Kok made a push to de-ideologize Labour in the early 1990s it may not have pleased the more left-wing parts of his party, but the “purple” governments he lead between 1994 and 2002 coupled tax cuts as gifts to the right with public investments and employment programs to please the left. Now there is a again a left-right government, but they’re divvying up costs rather than spending, which makes for altogether harsher policies. On election night, Labour Party leader Diederik Samson defensively but proudly declared that this government has implemented the deepest set of budget cuts of any government so far. As a result, even when compared to the equally dismal electoral results of the left in the early 1990s, the substance of political discourse and policy has shifted to the right. Prime Minister Rutte comforted his party by remarking that its losses had been smaller than feared. The result “looks wonderful when you compare it with a year ago,” he said. Which seems a bit overstated: in the European elections last May and the local elections last March, the VVD received 12% of the vote; now it got 16%. The extremely low turnout in those European elections (37%) and the high share of the vote taken by local parties in the municipal elections (28%) also made them ill-suited for comparative purposes. For what it’s worth, a year ago the VVD was polling at 13–17% of the vote; this year, just weeks before the elections, the VVD hit something of a low in the opinion polls of — depending which pollster you trust — 11–17%. The end result looks only slightly favorable in that context; it is pretty much in line with where the party has been polling for the last year and a half. The proportion between polls and election result was roughly the same for the Labour Party. For all the detail about just how horrible its result was, at least it leaned toward the upper end of the range (7–11%) foreseeen by the polls for the past year or so. The christian-democratic CDA and its leader, Sybrand Buma, were oddly triumphant about their election result (14.7%). Sure, it’s a fair way back up from the disastrous 8.5% of the vote the party pulled in the national elections of 2012 — easily its worst election result ever. But it’s only six-tenth of a percentage point better than the last provincial elections, four years ago — and that had been the party’s worst provincial election result since it was founded in the 1970s. It was also worse than its result in last year’s European elections, if only by a sliver, and barely better than its result in last year’s local elections, when it got 14.4% of the vote even as local parties took over a quarter of the total vote. It seems like a score of around 15% might be the new normal for the party right now — and considering that the CDA or one or more of its predecessor parties were represented in the national government for an unbroken run of 76 years (1918–1994), that’s really not very impressive. While touting his party’s strong performance, Freedom Party leader Geert Wilders did express some disappointment that it didn’t end up first, as had seemed possible for a while. For four-five months ahead of the provincial elections, the party had been leading the pack in two of the three national election polls. It had always been clear that this national polling would not necessarily translate into an equivalent result in provincial elections though, given the lower turnout. Moreover, the party’s standing had noticably slipped during the election campaign, as the two governing parties recovered slightly and the Socialist Party made some minor gains. In the end, the Freedom Party almost exactly replicated its performance in the last provincial elections, again getting 12% of the vote. One aspect of this result which wasn’t mentioned much in the media coverage, however, is that this helped the party seats-wise. After all, it was just last year that around one in six Freedom Party provincial legislators abandoned the party after Wilders’ ill-advised remarks at the party’s rally on the night of the municipal elections, when he made his followers chant that they wanted “fewer, fewer” Moroccans in the country. The campaign team of D66 leader Pechtold made sure, American campaign-style, that the TV coverage of the party’s election night rally would show him surrounded by a group of young and somewhat multicultural party members. Things were a little more awkward at the Labour Party rally. What must have smarted though was that the party ended up finishing fourth, behind the Democrats ‘66, whose leader Alexander Pechtold is a frequent and fierce critic of Wilders. With this result D66 successfully followed up on last year’s results, when it already became the third-largest party nationwide in municipal politics. It was the party’s best result in provincial or national elections since 1994 — only in last year’s European elections did it do even better. That’s an impressive achievement especially since, in the interim, the party had dropped to a dismal 2.0% of the vote in the 2006 national elections. I can’t find nationwide election results for the 1970 and 1982 local elections, but this result seems to be the party’s fourth-best ever, in any kind of elections. The Socialist Party (SP) performed well — certainly better than in last year’s municipal elections, when it also made significant gains in the number of seats it won but its nationwide share of the vote was limited to 6.6%. This time it won 11.7% of the vote, gaining two percentage points when compared to the national elections of 2012 and 1.5% compared to the previous provincial elections. A healthy score, no doubt — its second best ever in provincial elections. And yet one can’t help wondering if it also doesn’t represent a lost opportunity. The party’s main rival, the Labour Party, collapsed, losing a whopping 15% or so from its result less than three years ago — and yet the SP improved on its own score by a mere fraction of that amount. It’s not that it didn’t win a good amount of votes from Labour, it’s that D66 and the Green Left shared equally in those spoils, and many of the SP’s own voters from 2012 abstained this time (see below). Moreover, according to data by Maurice de Hond, about a third of the previous SP voters who did turn out scattered their votes across a range of other parties this time — primarily the Freedom Party, the Party for the Animals, regional parties and, perhaps surprisingly, the christian-democrats. The small christian parties, the Christian Union and the SGP, performed strongly as always in low-turnout elections, thanks to their disciplined electorate. In the past four provincial elections, they pooled 6–9% of the vote, and this year’s score (7.5%) falls right in the middle of that range. In national elections, however, they will doubtlessly drop back to their usual, pooled 5–6% of the vote. The result of the Green Left was, just like last year, ambiguous. The 5.4% of the vote it received constitutes something of a resurrection for a party that collapsed so completely in the 2012 elections, getting just 2.3% of the vote, that its obituaries were already being written. But it’s still the party’s worst result in provincial elections since 1994, down a percentage point compared to the last provincial elections, and not a tenth of a percentage point better than its score in last year’s municipal elections, despite the fact that local and regional parties took a much larger chunk of the vote then. Two pollsters published contradictory numbers about where the 2012 Labour Party voters went this time. On election night, public television cited exit poll results from Ipsos suggesting that, of those who switched votes, 34% went to the GreenLeft, 29% to the SP, and 20% to D66, but unfortunately those data don’t seem to be available online. Maurice de Hond’s polling data shows quite a different picture: of all 2012 Labour voters who voted again now, 36% stuck with their party, 19% went to the SP, 9% to D66, and just 8% to the Green Left. In general, Ipsos polling data which is available online suggest that the Freedom Party and the Labour party suffered most from abstention, which is not unusual, but the VVD suffered particularly from a failure to turn out its electorate as well, which is less common. In addition, the Labour party saw by far the highest rate of voters coming out to vote but only to switch to another party. As always, the orthodox protestant SGP suffered least from both — but then there’s a reason why the party has had either 2 or 3 seats in parliament since 1925. What now, little lion land? At the traditional election night debate with the party leaders, each one of them of course hurried to emphasize the positive. As always, winners gloated over their gains, those who didn’t win or lose any particularly great amount stressed how they’d recovered from prior losses, and those who clearly lost asserted that the losses hadn’t been as bad as feared and ground had been recovered during the campaign, even as they contritely admitted that things should have gone better. But what struck me most was that none of the party leaders other than the SP’s Emile Roemer (the Freedom Party’s Geert Wilders was absent) called for a radical change of course. The government parties regretted not having been able to persuade enough voters, but insisted that they had done what was necessary, even when it was not popular, and there was no alternative to forging ahead. The constructive opposition insisted on staying the course and only making changes to the extent that further speed and determination were needed in the economic reforms. If anything, we’d like to move policies further to the right, the SGP leader said. Work on tax reforms must start immediately, D66 leader Pechtold demanded, but should not threaten balanced budgets. Which means, though he left it unmentioned, that those tax cuts will have to be offset by further budget cuts (something the Labour Party election campaign at least called them out on). The leaders of opposition parties CDA and Green Left also demanded policy changes, of course, but they, too, highlighted that they were ready to help think through the necessary reforms, to support constructive policies, to take responsibility, and so forth. All in all, in addition to seeming near-collectively wedded to some degree of neoliberal policy as a self-evident necessity, the leaders of opposition and government parties alike seemed to get along fine, in a discussion characterized by friendly banter and a collective attitude along the lines of “we’re in this together and we’ll just have to work this out together”. When there was a bit of occasional showboating, all present seemed to be aware it wasn’t to be taken literally — like when opposition leaders vowed to not take part any back room talks and Prime Minister Rutte reminded them that they already took part in regular behind-the-scenes discussions. Much of the voters’ frustration stems from austerity measures the government has enacted over the past two years, such as cuts in health benefits and hikes in excise taxes. But the elections have actually strengthened the political forces demanding austerity. Both D66 and the Christian Democrats insist that the government commit in advance to new deficit-cutting measures to balance out any tax cuts. This seems a little too convenient though. 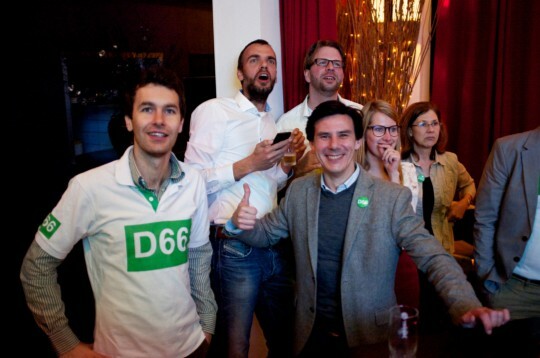 D66 is riding high, and the CDA made gains at least compared to the last national elections. But the christian-democrats are still at a near-historic low; the Labour Party is at an all-time historic low; the VVD got its worst result in provincial elections in almost 25 years; and the small christian parties got around the same level of support they always get. The mainstream parties, having over time converged onto a consensual commitment to austerity, are collectively doing worse than at any time in Dutch political history. 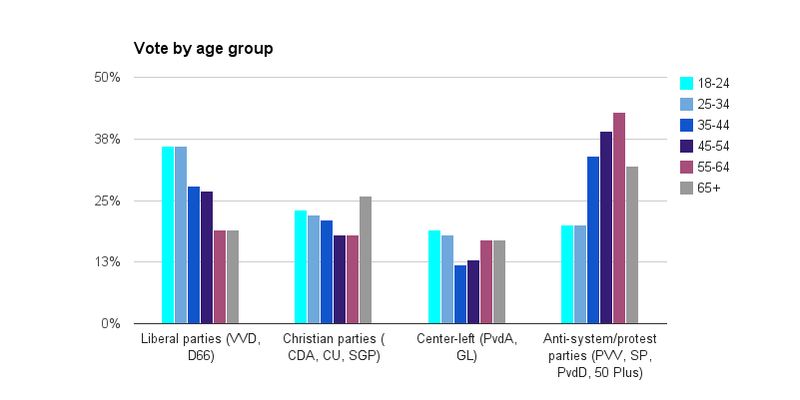 Together, VVD + Labour + CDA + D66 + the small christian parties pooled just over 60% of the vote, an all-time low. In 2012, it was 73%; in 2003 it was 82%; and in 1989 it was 94%. The parties that have most vocally opposed the government’s austerity policies, i.e. the far-left Socialist Party, the far-right Freedom Party, the Party for the Animals and the senior-interest party 50Plus, may individually have increased their vote by just two percentage points compared to 2012, but each of them did gain 2 points, meaning that together they pooled 30% of the vote compared with 24% two years ago — and 17% at the provincial elections of 2007, before the global economic crisis. The Dutch electorate is increasingly alienated from the mainstream political discourse, and yet there was little hint of a crisis at the party leaders debate. Aside from the Socialist Party’s Roemer, who accused the government of having failed and leaving many people struggling to get by, the only party leader to express any fundamental disagreement was Marianne Thieme from the Party for the Animals. She pleaded for an economic reorientation away from the logic of growth, and remarked that the substantive differences between all the other parties had come to seem small. But she was gently chided by the Christian Union’s Arie Slob: if ideological differences seemed small right now, he told her, it was because with over 600 thousand unemployed “we’ll just have to set aside our differences”. Of course, Thieme, Roemer and maybe even Wilders would probably argue that if the course which the country has been on has lead to over 600 thousand unemployed, maybe the logical response might not necessarily be for all parties to join in and lend a helping hand, but rather to call for a drastic break and start pulling a different way altogether. An SP-friendly political cartoon. Labour leader Samson is wielding the wrecking ball, demolishing the health care system. Socialist leader Roemer is coming running, calling out at him to stop. Samson responds by saying: you guys are just yelling from the sidelines. At least we are taking our responsibility. Duivesteijn has little to lose in staking out this position: he has been diagnosed with prostrate cancer at an advanced stage, and will be retiring in May. But at least Labour’s former voters agree with him. When looking at a longer-term perspective than just the gains and losses compared to the last elections, polling data released this week by Maurice de Hond suggested that Labour has lost a lot more ground among working class voters who feel resentful about the dismantling of the welfare state than among the confident middle class voters who are currently gravitating towards D66. It has also lost them more thoroughly. Dividing up the Dutch electorate between people who would now vote, or at least consider voting, Labour (17%); people who have at some point in the past voted Labour but would not consider it anymore now (24%); and those who never voted Labour and wouldn’t now (59%), the poll found large differences between the former two groups. Those who abandoned Labour are much more likely to have lower education levels: 41% of this group has only lower education, versus 15% of those who’d still consider voting Labour. An overwhelming majority of them (80% or more) agrees with the statements “I don’t know what the Labour Party stands for anymore”, “The Labour Party is betraying its ideals” and “the Labour Party is abandoning the weakest in society”. Of those who still vote, 32% of them now vote SP and 15% for the Freedom Party. And none of the three alternative Labour Party leaders whom de Hond asked about would bring more than 13% of them back. Meanwhile, the immediate aftermath of the provincial elections has seen some distinct shifts in the polls. The VVD has been making the most gains since it came first in the elections — everyone likes a winner — but D66 has had to yield some ground. The Freedom Party has been losing support, but the Socialists have gained some. At provincial level, not a whole lot is expected to change in government. As is the case with many municipal governments, the “executive councils” that serve as provincial governments tend to consist of wide-ranging coalitions that include most or even all the major parties. The VVD was part of 11 of the 12 provincial executives in the last four years, and the CDA was represented in 10 of the 12. That’s how you can have provincial governments that include both the VVD and the Green Left (in Utrecht) or both the VVD and the Socialist Party (in South-Holland and North-Brabant). As a result, ideological contrasts are downplayed — much more so, still, than in national politics. In the past four years only Overijssel had an executive with only right-of-center parties (VVD, CDA and the small christian parties). An informational billboard for the provincial elections with posters for the different parties. The Freedom Party one features Geert Wilders and the slogan Enough Is Enough; the Socialist Party’s slogan could be loosely translated as Settle The Score. D66 has been running with the slogan Now, Forward, while the Party for the Animals appeals to voters to Stick To Your Ideals. Photo by Patrick Rasenberg, licensed under Creative Commons. Judging on early negotiation results, the main difference in the upcoming period will be that Labour will be represented in fewer provincial governments, and the SP in more. The Socialists, so far included in just two of them, will now be part of six. Labour, still represented in eleven of the twelve provincial governments in 2003, are now down to five. In the northern province of Friesland it will be the first time since 1946 that Labour will not be included in the provincial executive. The VVD, on the other hand, despite its losses, will remain included in 11 provinces, and the christian-democrats even look set to be part in all 12. D66 are likely to take part in eight. The occasional inclusion of even parties as far left or right as the Socialists or the Freedom Party in provincial government also leads to some idiosyncrasies in how provincial parties position themselves — something which, due to the low profile of provincial politics, will likely go unnoticed by their own voters. If you scrutinize a voter test for the province of South-Holland, for example, you will find that the Socialist Party there stakes out positions to the right of both the Green Left and the Labour Party on 8 of the 30 questions, ranging from budget cuts to the environment and asylum-seekers. Especially the first seems pretty atypical, but might well have to do with the party’s inclusion in provincial government there. Some provincial politicians choose instead to avoid taking a public position on anything much altogether. In Gelderland there was a provincial legislator from the Freedom Party who managed to not utter a single word for the full four years he served — a record, apparently. Perhaps he was following the example of a municipal councilor in the same province back in the 1990s. Henny Selhorst, serving as a councilor for the more radically far-right (and misleadingly named) Centre Democrats in Arnhem, managed to utter a full seven words during the four years of his term, six of which he spoke during the opening session. Selhorst had something of an excuse at least, though, since he spent a total of two of those four years in prison, for two succesive arrests over dealing hard drugs. Class cleavages may not determine election outcomes as much as they once did, but they still played an important role, voting patterns by income and education reveal. Both exit poll data by Ipsos and separate polling data by Maurice de Hond confirmed that the VVD, D66 and Green Left do particularly well among those with higher education, and VVD and D66 (but not the Green Left) also do particularly well among higher income voters. Vice versa, the Freedom Party and the Socialist party did especially well among lower education voters and among voters with lower incomes. Because of the fragmentation of the vote, no party holds much of a dominion over a specific income or education group. Even the VVD’s dominance among upper income voters isn’t what it used to be: it received about a quarter to a third of those voters, experiencing marked competition from D66 and the Christian-Democrats. The result is obvious enough: the left does better the lower the income group, the right does better the higher the incomes. 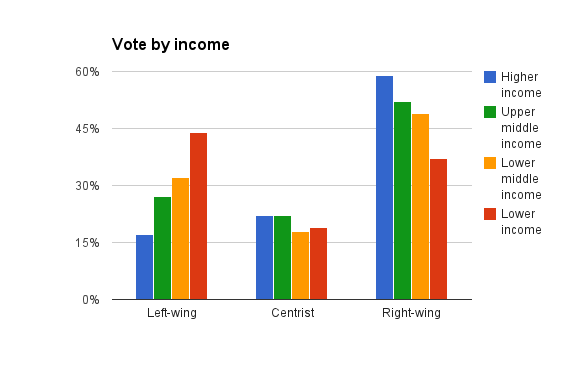 Note, though, that even among lower income voters the left is barely ahead. Support for the right among lower income voters, however, is quite different in nature from that among the upper income electorate. 32% of upper income voters opted for the VVD, according to de Hond’s poll, and just 6% for the Freedom Party. The proportions among lower income voters were somewhat inverted: a fairly modest 14% for the Freedom Party, but just 7% for the VVD. There are similar contradictions among the left — the Socialist overwhelmingly relies on lower income groups (getting 20% of the lower income vote and just 3% of the upper income vote), but support for the Labour Party and the Party for the Animals is more evenly spread. This breakdown, which tentatively groups together the Freedom Party, the Socialist Party, the Party for the Animals and 50Plus as anti-system parties of sorts, presents an alternative contrast of where the dividing lines by class lie. Upper income groups feel comfortable with what one could call the ruling policy consensus and vote disproportionately for the liberal parties, and more broadly with parties on the center-right. The sentiment starts tipping among lower middle income voters, whose vote is as likely to go to the Freedom Party (14%) or Socialist Party (13%) as to the VVD or CDA (13% each). The alienation from mainstream politics is pitched more sharply among lower income voters, among whom the Socialists rank first and the Freedom Party second. A similar breakdown by education mostly shows the same contrast. One wrinkle is the role of the center-left parties (Labour and the Green Left). Both of those parties appeal most to voters with low incomes, but also most to those with higher education. If these contrasts by income and education seem stark, they weren’t actually at their most pointed. 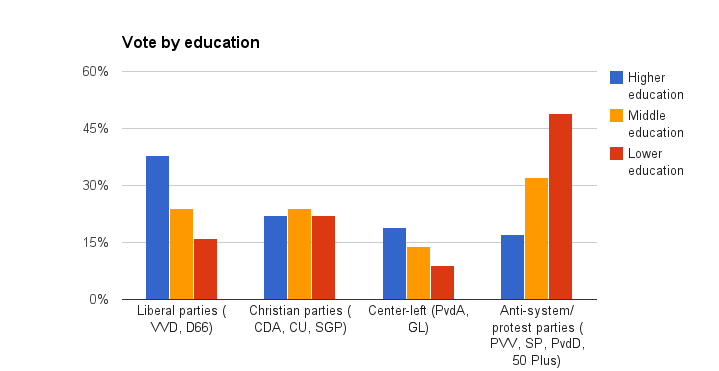 In similar polling by de Hond a little over a year ago, the Freedom Party and Socialist Party alone already pooled a massive 56% of lower education voters versus just 16% of higher education voters. 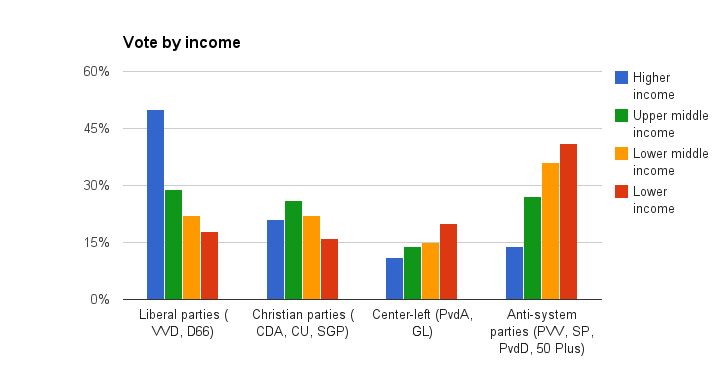 Vice versa, the liberal parties VVD and D66 then pooled an identically massive 56% of higher income voters, versus just 12% of lower income voters. That’s a serious class divide, which I would argue places a time bomb of sorts under the Dutch governance model if it is left to fester. That’s a striking result in itself, especially since it has definitely not always been like that. It poses some uncomfortable questions especially for the left, which has long relied on young voters to bolster its successive challenges to the status quo. The Labour Party’s electorate in particular has long been aging, and the party is now actually strongest among those aged 65 and up, according to both the Ipsos and de Hond data. But the Socialist Party’s appeal to the youth is similarly lacking. Much like the Freedom Party, it seems to rely largely on middle-aged voters, showing particular strength among those aged 45–64. In part, this could be a reflection of how insecure people in that age group, in particular, feel about the state of the economy and the country’s social services. Unlike young people, they might be especially aware of how dependent they will be on the latter soon enough, and unlike young people, those in that age group who are unemployed, underemployed, or fearful of being either will have less confidence about future growth and opportunities solving it all. Regrouping the political categories might seem to bolster this theory. 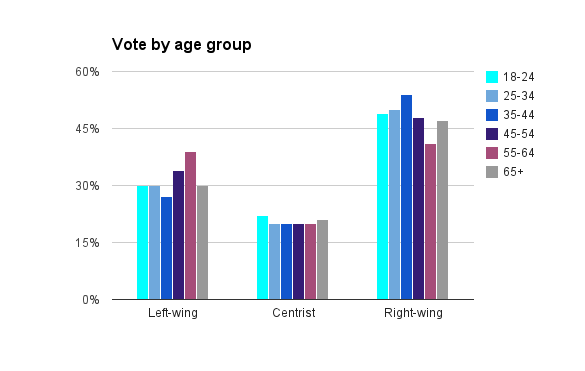 The liberal parties are well over-represented in the youngest age groups, while the vote for the anti-system parties (for lack of a better label) peaks in the age group approaching retirement. This too should constitute a warning sign for the left: in stark contrast with countries like Spain and Greece where the youth has been spearheading leftist revolts against right-wing economic policies, in the Netherlands the generation that grew up with austerity seems to feel pretty comfortable with it. A critic might speculate that this is a reflection of how today’s youth has been told by politicians, pundits and the press alike that there is no alternative for as long as they can remember. In fact, the patterns in these breakdowns by age could also be interpreted as a reflection of the age in which voters experienced their formative years. A fascinating data visualization by the New York Times last year chronicled the voting behavior of each generation of white U.S. voters as they aged, showing a surprising continuity in preferences that seem to have solidified at an early age. “Events at age 18 are about three times as powerful as those at age 40,” the Times’ model suggested. Thus, “by the time Eisenhower left office in 1961, people born in the early 1940s had accumulated pro-Republican sentiment that would last their entire lifetimes” and “Childhoods and formative years under Kennedy, Johnson and Nixon left [baby boomers] relatively pro-Democratic”. Applying that theory to the Dutch data, it’s interesting that the polling numbers by de Hond don’t just show support for the Socialists peaking among 45–64 year olds, they also show the Party for the Animals doing best among 55–65 year olds — and while the Green Left generally gets weaker the older voters are, there’s a distinct uptick in its support among that same 55–65 age group. 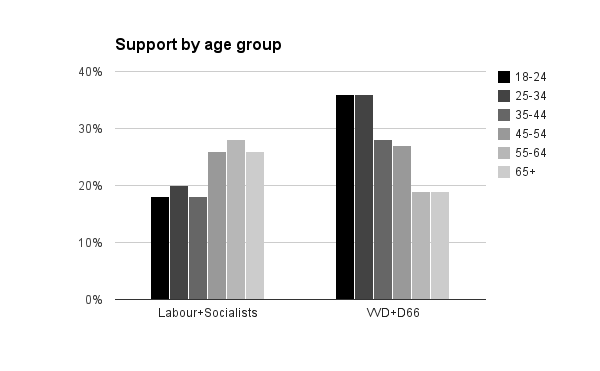 Similarly, the Ipsos data show the Socialists overperforming by far the most among 50–64 year olds. And Ipsos, too, shows the Green Left doing best among the youngest voters, but 50–64 year olds as the only other age group among which it overperforms. All of which would make some sense from the perspective of the New York Times piece. After all, these are the people who grew up in the 1970s, maybe early 1980s — and those are generally seen as the most left-wing years of Holland’s post-war history. By the same count, of course, this would mean that the current crop of 18–35 year olds is set to retain an inclination towards liberal parties for most of their life, and the relative lack of enthusiasm of voters under 45 for socialist/social-democratic parties isn’t going to change significantly anymore either as they grow old. Map based on official results by municipality, which can be downloaded as spreadsheet from the Electoral Council site. The electoral map is as fragmented, but also as revealing, as the overall result. As colorful as the whole is, the west of the country is a sea of liberal blue; many rural areas in south, east and west remain christian-democratic green; and there is a notable dearth of socialist/social-democratic red. The centrist D66 scored a hat-trick, coming first in three of the four main cities (Amsterdam, The Hague and Utrecht), just like it did in last year’s municipal elections. It also came out on top in the university cities Leiden and Delft, the medium-sized cities of Haarlem, Gouda and Amersfoort, and the commuter town Culemborg. But the party’s appeal remains firmly rooted in the cities of the West, or what the Dutch call the Randstad. In Rotterdam, the country’s second-largest city and the world’s third-largest port, first place went to the Freedom Party (orange on the map). 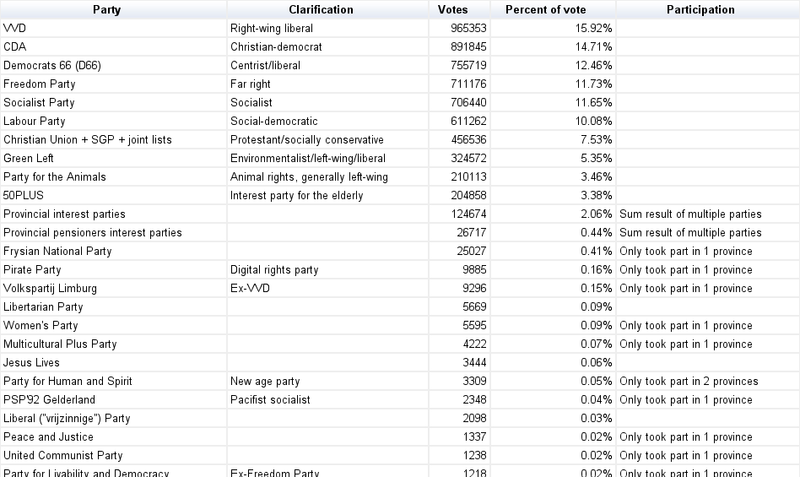 The vote was very fragmented though, with the Freedom Party getting 17% of the vote. Astoundingly, Labour ended up back in fifth, with a mere 12% — an even worse result than in last year’s local elections. Keep in mind: in 1977 the Labour Party still received 55% of the city’s vote. Things are only marginally better for the party in Amsterdam. 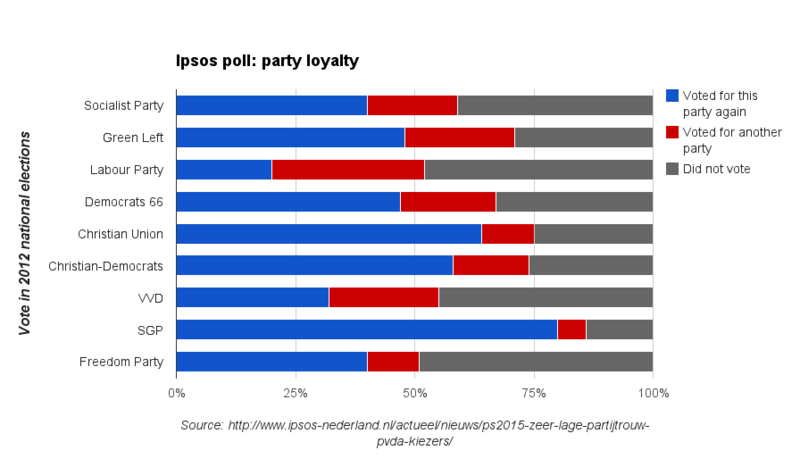 While at least securing second place (behind D66), the Labour Party still only received 15% of the vote. Last year’s municipal elections already marked the first time since World War II that Labour did not emerge as the largest party in the city, getting just 18% of the vote. The social-democrats used to get some 40% of the vote here. Its not just the Labour Party which is on the defense in the country’s capital; it’s the left as a whole. In the national elections of 2006, parties to the left of D66 pulled a whopping 65% of the vote — an almost Berlin-like score. This time the counter stopped just below the 50% mark. That still made for the second-highest number in the Netherlands (behind Nijmegen), and the left fared a lot worse in the other main cities: 42% in Utrecht, 37% in Rotterdam and 33% in The Hague. 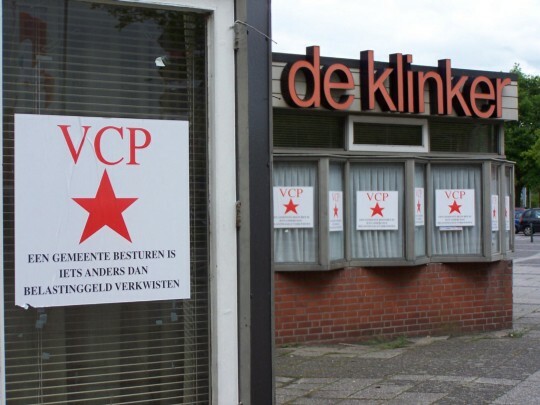 Compared with the provincial elections four years ago, the Labour Party lost ground in every single municipality of the country, the Volkskrant reported. Its collapse was the most comprehensive in the party’s traditional heartland in the Northeast. Of the ten municipalities where its losses where heaviest, nine were in the eastern half of the province of Groningen. In Pekela, Menterwolde and Veendam, the party’s losses from the previous provincial elections exceeded 19%, in the former two reducing the party’s vote to a third or less of its size. In Menterwolde Labour still got 49% of the vote in the national elections of 1998. Now, it received 8.5%, well behind the Socialists (22%), and also behind a provincial interest party and the Freedom Party (which got 12%). In the province of Groningen as a whole, it was the first time since WWII that Labour failed to emerge as largest party in provincial elections. 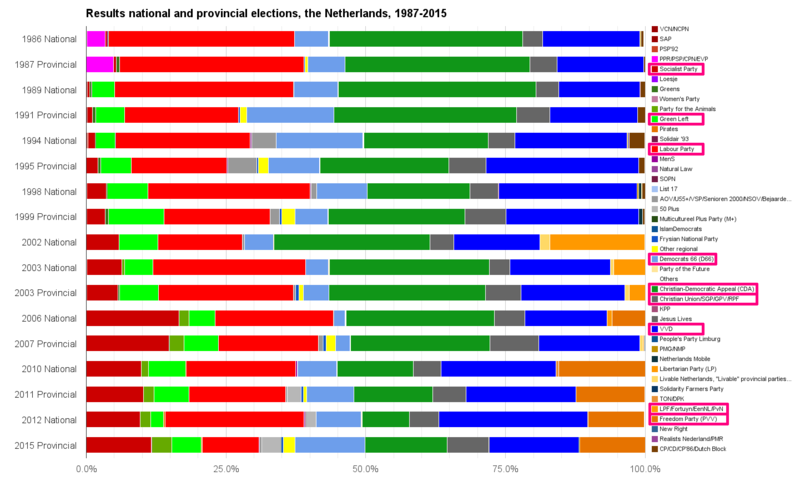 All of this was a repeat of last year’s patterns, when six of the seven municipalities where the party lost most were in the province of Groningen. This time, however, there was a specific additional cause for its disproportional losses there, one which highly benefited the regional interest parties which ended up pooling over 12% of the vote in the province: earthquakes. Yes, in the Netherlands. Man-induced — or should that be greed-induced? — earthquakes: it’s a long story, and it involves billions of gas revenues flowing to the national Treasury and the locals being stuck with collapsing buildings. Check out this neat visualization too. The only municipality where a party got over 50% of the vote was Tubbergen, where the christian-democratic CDA received 56% of the vote. That’s still a far cry from 2003, though, when it was 80% — the Freedom Party and the VVD made some inroads in this rural and very catholic constituency. On the other end of the scale, the CDA had to make do with just 3.3% of the vote in Amsterdam, ranking eighth — with barely over half the votes received by the Party for the Animals. The Christian-Democrats didn’t rank first in any of the country’s twenty largest cities: Emmen (pop. 109 thousand) was the most populous town where it lead. Curiously, that means that both of the top two parties performed relatively weakly in the country’s cities. When it comes to taking first places, at least, the VVD ‘scored’ only a few among the country’s top 20 cities, and nothing bigger than Breda (pop. 175 thousand) and Apeldoorn (pop. 156 thousand). (All such first places are purely symbolic, of course, since the Dutch electoral system does not have districts; legislators are elected through province- or nation-wide party lists.) The VVD more than compensated for this, though, by coloring most of the provinces of North-Holland, South-Holland and Utrecht blue. I imagine its success in those provinces (especially North Holland, where Labour used to be strong in rural areas as well, and South-Holland, where the christian-democrats used to dominate the countryside) has a lot to do with sub- and exurbanization. Prototypical VVD ‘wins’ included Haarlemmermeer and Zoetermeer, once-rural municipalities that were turned into commuter towns since the 1970s/1980s. Further rural communities in the West seem to have seen a fair amount of well-off urbanites move in, converting farmhouses and the like. Perhaps that helps explains how a place like Beemster took a surprise second place in the list of top VVD results, ahead of famously wealthy towns like Wassenaar, Blaricum and Rozendaal that have long been VVD bulwarks. This map of median disposable incomes by municipality in 2012 is helpful in that regard, showing that most of the countryside in between and around the four main cities now counts among the country’s most prosperous municipalities. Below, I will mention how two villages in North Holland (Warder and Middelie) used to yield an 80%+ vote for the left, right after World War Two; now they belong to the municipality of Zeevang, right next to Beemster, and the VVD received 29% of the vote there. The two villages still exist, but in the national elections two years ago even gave 37% and 46% of their vote to the VVD. This bit of history, translated from the Dutch Wikipedia page, can’t be unrelated: “The increase in scale in agriculture resulted in many farms closing their business. 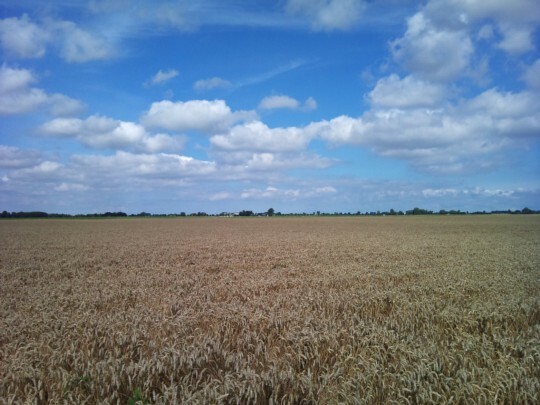 Consequently only ten of the 80 full-time farming businesses that existed in 1945 still exist. The farmhouses that remained empty turned out to be popular objects for people from cities like Amsterdam and Haarlem to renovate into comfortable houses and a migration flow started from the cities to countryside villages like Warder”. D66 on the other hand, as mentioned above, is by far the strongest in large and mid-sized cities. Outside such cities and away from the West, its popularity flags, and the only four municipalities where it took first place outside the Randstad were clustered around the university towns Nijmegen and Wageningen and the nearby town of Arnhem. In several cities away from the Randstad where D66 had still come out on top last year, it now had to relinquish this honor to the Socialists. All in all, the party received 17% of the vote in the centrally located province of Utrecht, but just 7% up in Frysia and down in Zeeland. The regions where it’s strongest happen to also be those where the population is youngest, growing at the fastest rate, and most highly educated. Note that the pooled results of these two parties require a different scale of their own: such is the contrast between its bulwarks and the rest of the country. Most everything to the south/east of the Bible Belt is ancestrally catholic; many of the non-urban parts to the north/west of the Bible Belt is traditionally protestant but of the more mainstream or liberal (vrijzinnig) varieties. If you were wondering what that range of grey municipalities in the map at the top of this section is, stretching from the southwest through to the shores of the IJsselmeer, that’s the Dutch Bible Belt. In every election, some of the most geographically concentrated results come from the small calvinist State Reformed Party (SGP) and the other socially conservative protestant party, the Christian Union. The SGP, notably, only allowed women to become party members in 2006, and only made it possible for women to run for office on its lists last year — and both times, only in the face of judicial pressure from Dutch courts and the European Court of Human Rights. Nationally, these two parties may have pooled 7.5% of the vote, but in some municipalities, they rule the roost. In the fishing village of Urk the two of them pooled 72% of the vote; in rural Staphorst 59%. There’s more info about these parties in my post about last year’s local elections. A eagle-eyed observer may have already noticed in the map at the top of this section that something odd happened in a municipality down in the very south of the country, in the province of Limburg: the honor of ranking first was shared by the Socialist Party (SP) and the Freedom Party (PVV). That’s Maastricht (pop. 120 thousand). Of the some 91 thousand eligible voters there, less than 39 thousand showed up, and the SP and VVD both received exactly 6,284 of them. That turnout rate of 42.5% was low — as was turnout in the whole province of Limburg, at 45% — but it was far from the lowest. Rotterdam won that prize, with a turnout of 35.1%. It’s not altogether coincidental that two cities with low turnout also saw the Freedom Party do so well — alienation from the political system is reflected both ways. The list of municipalities where the party received the highest percentage of the vote, however, looks quite different. The Freedom Party received 24–25% in three former mining communities in the southeast (Kerkrade, Landgraaf, Onderbanken) as well as Stein, also in Limburg. It got 26% of the vote in Edam-Volendam; its strength there lies in the fishing town of Volendam, where it received 32% of the vote, rather than in Edam (12%). Finally, it received 33% in the municipality of Rucphen, which has a long history of supporting right-wing populist forces whenever they appear. More precisely, it’s Sint Willibrord, traditionally a bricklayers and carpenters village, which does so, and these elections were no exception: in each of the three precincts there, the Freedom Party netted over 50% of the votes! Onderbanken, Volendam, Sint Willibrord: these places are certainly not cauldrons of multiculturalism. While Kerkrade and Landgraaf include quite a few German residents, CBS statline pegs the percentage of non-Western population in all these municipalities at just 2–5%. Common denominators might instead be, to some extent, rather insular communities and a tradition of exclusion/resentment. But in addition to a couple of larger placed like Heerlen, Venlo and Sittard-Geleen, the top 20 Freedom Party results include plenty of further small-town municipalities which don’t quite have the unique profile of Volendam or Sint Willibrord: Brunssum, Steenbergen, Simpelveld, Roerdalen, Woensdrecht, Vaals, Beek … Many of those are in Limburg, and that province has consistently shown a strong ‘native son’ enthusiasm for Geert Wilders, who was born in Venlo. But not all of them are, and that doesn’t explain why, for example, the Freedom Party received some 30% of the vote in the village of Spijk, part of the municipality of Rijnwaarden. There are barely any immigrants in Spijk, but “dissatisfaction with the traditional parties, a lack of [political] attention, the disappearance of social services, problems with pensions [were] all reasons why residents of Spijk voted for the Freedom Party,” a local newspaper explained when the party did equally well there four years ago. After citing prof. Pieter Winsemius about how the residents of many Dutch villages feel abandoned, it quoted a local to prove the point: “The young people are leaving because no new houses have been built for years,” all the shops have closed, the local football club has been disbanded, public transport doesn’t get to Spijk and there are too few streetlights along the bicycling path. Another voter added that “we have nothing against foreigners, but they have to behave. Just look at ‘Opsporing Verzocht’ [a popular TV show about crime], it’s all colored people.” You don’t need to actually know any immigrants to have an opinion about them. The Socialist Party, in addition to its shared first place in Maastricht, came first in Eindhoven, Tilburg, Groningen, Enschede, Heerlen, Oss, Helmond, and Hengelo, as well as a range of smaller places. All of these except for Oss and Helmond have long been among the relatively major cities of the country — but not a single one of them is in the Randstad. They’re all out in the provinces, whether north, east or south. Some of these cities boast or used to boast a major industry, like Philips in Eindhoven, or the textile industry of Hengelo and Enschede until it collapsed in the 1970s. Most of them have a strongly industrial tradition, actually: except for Maastricht, every one of them belonged to the 40 (out of over 1,000 then-existing) Dutch municipalities of 1930 where over 70% of the employed population was an industrial worker. All except for Groningen and Helmond belonged to the 28 Dutch towns which, in the same year, boasted at least one factory that employed over 1,000 workers. That’s very much past tense, though: Maastricht, Eindhoven, Tilburg, Groningen, Enschede and Heerlen now actually belong to the bottom-fifth of Dutch municipalities regarding the percentage of blue-collar workers. Industrial employment and work in the trade and transport sector are mostly concentrated in small towns and rural areas nowadays. Instead, half of these cities (Maastricht, Groningen, Enschede, Heerlen) rank in the top fifth of municipalities when it comes to the share of government & health care employees; but Eindhoven, Helmond and Oss have a below-average share of those. The Socialist Party’s roots in eastern Brabant go beyond Roemer’s personal background. Like I wrote last year, the SP was getting over 20% of the vote in Oss even when it was still a Maoist splinter with a national vote of just 0.3%. Its brand of local and neighborhood activism apparently fit well with the clientalist tradition of local Catholic politicking. Maybe it made it easier for voters to shake off the stern threats against voting for the “reds” by yesteryear’s priests, which had traditionally kept the Labour Party weak in the south. 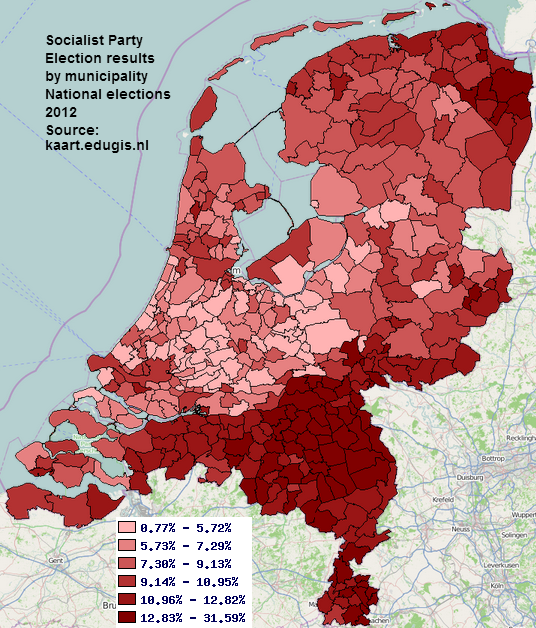 Comparing the 2012 elections map for the SP with that of catholicism in the Netherlands suggests a definite correlation. But just like in last year’s local elections, the SP’s electoral map for the provincial elections shows it is more broadly developing an electorate in the peripheries, away from the bustling cities in the West with their multicultural populations and white-collar economies, expanding from its traditional base into more provincial cities and the economically ailing northeast. How do these sometimes conflicting geographic patterns translate into the relative dominance of one or the other ideological current? The maps above investigate that question, and unsurprisingly find the christian parties dominant primarily in the (deeply protestant) Bible Belt, but also in the (deeply catholic) northeastern part of Overijssel. The liberal parties do best in the Randstad, though more so in its northern ‘wing’ (Amsterdam/Utrecht) than the southern ‘wing’ (Rotterdam/The Hague), as well as the leafier parts of the countryside in North-Brabant, Gelderland and Drenthe. The ‘red’ (socialist/social-democratic) parties still perform well in Amsterdam, but otherwise rely on provincial strengths in north, east and south. Broadening the scope of left-of-center politics somewhat and including the Green Left and the Party for the Animals changes that image somewhat and gives more prominence to major cities and especially university towns (e.g. Amsterdam, Utrecht, Nijmegen, Leiden, Wageningen). There is a distinct shift in geographic focus over time. For some fourty years, up until the late fourties, left-wing parties would pool over 45% of the vote in the province of North-Holland; in 1946 it was the country’s most left-wing province. Its support there was not limited to the cities either; it extended into most small towns and villages, thanks in part perhaps to the prevalence of liberal protestant denominations. But the left’s relative strength in the province declined steadily until, in the late 1990s, it did barely better there than in the country overall. The province of South-Holland became ever more friendly territory, relative to the national average, from the 1920s through to the mid-1960s, but has been trending away from the left ever since, with no end in sight. In Groningen, however, the left had kept consistently overperforming by roughly the same large margin throughout the post-war era — which makes Labour’s massive losses there this year and last year, only partially offset by SP gains, stand out all the more. On the flipside, in those parts of the country where the left did very weakly, or was barely present at all, in 1946 it has done much better from the 1970s onward. The result of these countervailing trends is what stands out most of all in these maps, aside from the left’s general weakness in last month’s elections: the overall blurring of geographical patterns. The huge contrasts which existed between highs and lows in the results of 1946 became ever less pronounced. Back in 1946, there were 73 municipalities where the Labour Party and the Communists pooled over 60% of the vote — and 151 of them where the vote for the two parties added up to less than a piddling 5% of the vote. There were even six (mostly tiny) municipalities where the cumulative result for the social-democrats and communists was over 80% of the vote, and not one of them was in Groningen: Middelie, Oudendijk, Jisp, Ammerstol, Warder, Idaarderadeel. Vice versa, there were four where they received less than half a percentage point (five votes at most): Beers; Vessem, Wintelre en Knegsel; Westerhoven and Zeeland. All of which were hamlets in the catholic south. 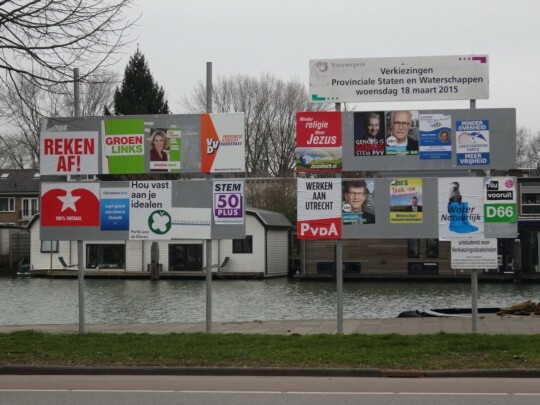 Boxmeer, where the Socialist Party got its best result in the country last month, was just another staunchly catholic village back then, where the Catholic People’s Party (KVP) got 94% of the vote. Because that’s how it was: the religious political camps had even more pronounced strongholds and no-go areas. This was especially the case with the KVP, which received over 90% of the vote in no fewer than 169 municipalities, but at the same time got less than 5% in a massive 339 municipalities. 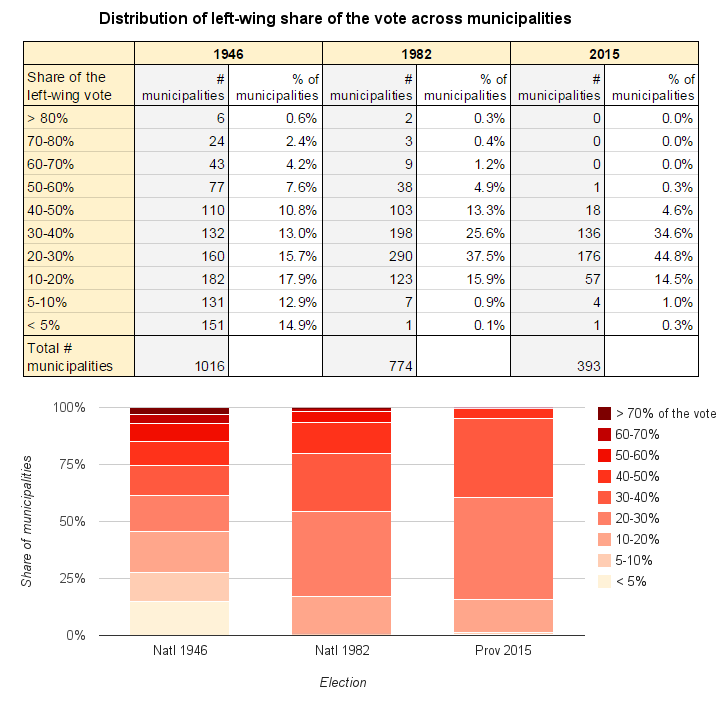 Similarly, the three protestant parties of the time (ARP, CHU and SGP) also managed to pool over 70% of the vote in 89 municipalities, while getting less than 5% in 285 of them. Sometimes, sharp contrasts could be found even between neighboring municipalities. Finsterwolde may have given 56% of its vote to the communists (and another 24% to the Labour Party), the citizens of the neighboring villages of Midwolda and Oostwold didn’t feel the same way; in their municipality, the Communist Party got just 8%, while over 50% of the vote went to the protestant parties. In Middelie, North-Holland, the Labour Party may have gotten 86% of the vote (with the communists coming in second), but in neighbouring Edam-Volendam it was the KVP which got 66%, with Labour languishing at 17%. Contrasts between neighboring villages of different religions were even starker: in Voorhout, South-Holland, 84% voted for the KVP, but in Rijnsburg 88% voted for the protestant parties ARP (52%) or CHU (36%). By 1982, the number of such extreme results was drastically reduced. The left, which by then consisted of a large Labour Party and five small parties to its left, got over 80% of the vote in just two municipalities: the communist bulwarks of Finsterwolde and Beerta, up in the country’s northeastern corner. At the same time, there was also just one municipality left where it polled less than 5% of the vote: Urk. 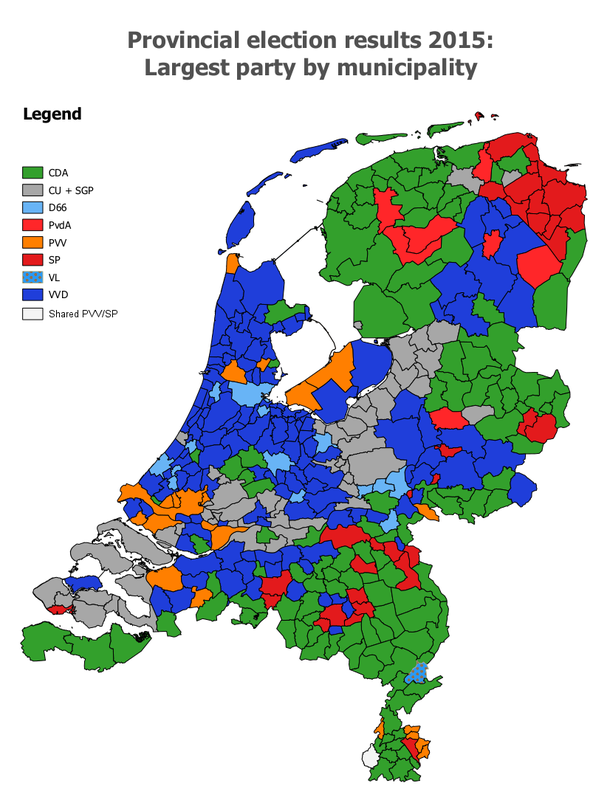 Same with the christian parties: KVP, ARP and CHU had by then merged into the CDA, but there were only two municipalities where that new force received over 70% of the vote: Weerselo and Tubbergen. This year, as mentioned, there was only one municipality where a party received even just over 50% of the vote by itself (Tubbergen, CDA). And there wasn’t a single municipality where the left, even when added up together, polled over 51% of the vote. Some part of this flattening out of results is due to successive rounds of local government reorganizations, which created ever larger municipalities and served to blend out local political peculiarities (and I’ll get into an example of that below). The main chunk of it, however, is the result of secularization. The religious parties used to hold their respective community ‘pillars’ in a tight grip: if you were catholic, for example, you read the catholic newspaper, listened to the catholic radio station, went to the catholic sports club, married a fellow catholic, and certainly voted for the catholic party (which explains how pale the south is in the left-most map). The so-called ‘depillarization’ of the 1960s-70s lifted many of those barriers, allowing the left to expand into the south; but at the same time depillarization also rapidly eroded what had been the socialists’ own ‘pillar’, which had equally bound its community together with a ‘red’ TV and radio station and social-democratic trade unions, newspapers, sports clubs, hiking clubs and health insurance cooperatives. A third cause of the evening out of geographic political contrasts, itself contributing to the depillarization as well, must have been a mix of domestic migration/mobility and an increase of scale in daily lives. As villages turned into suburbs, young people moved to the cities, retirees moved to the countryside, white working class residents moved out of the inner cities and immigrants moved into them, workers started commuting longer distances, and people became ever more reliant on mass media instead of local networks for their information (and arguably socialization), differences have blended out ever more. A global phenomenon, of course. But perhaps especially strong in a small, highly urbanized and largely trade and services-reliant country like the Netherlands? Finally, this is where I get to write about one of the most interesting details of Dutch political geography, namely that spot right in the very northeast of the country where the only municipalities used to be where communists were ever dominant in the Netherlands. And where they still held on, quixotically, like Asterix and Obelix in a remote corner of the Roman empire, even after 1989. That year didn’t just mark the collapse of the Soviet empire, it was also the last year two small, stubbornly communist municipalities called Finsterwolde and Beerta existed as independent entities. The residents of the two villages had been voting communist ever since 1922, and had kept doing so locally even after they’d taken to voting Labour in national elections in the late 1970s. Beerta was the only Dutch municipality to ever have had a communist mayor. Vice versa, both Beerta (in 1934–35) and Finsterwolde (in 1951–53) once had their local government and municipal council disbanded by the Dutch state and replaced by a ‘government commissioner’. Communist strength here was rooted in conditions of extreme local inequality: the local ‘gentleman farmers’, as they were called, used to earn 40–50 times as much as the farm labourers who tilled their land. In 1990, however, Finsterwolde and Beerta were to merge with Nieuweschans into a larger, new municipality called Reiderland (pop. 7,000 or so). 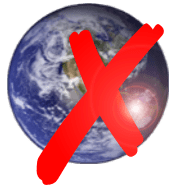 That was expected to deal a blow to the communists’ dominance, especially given world events — not to mention the self-dissolution of the Dutch Communist Party, which merged into the Green Left. But it didn’t. The local diehards just created a New Communist Party (NCPN) and promptly won 50% of the vote in the new municipality’s elections in 1994. That support rapidly melted away in subsequent years after all, however, to 36% in 1998 and 18% in 2006. So when Reiderland in its turn fell victim to municipal restructuring and was merged into a newly created entity called Oldambt (pop. 39,000), that was sure to sound the death knell for the communists once and for all. The new municipality was to be dominated by the town of Winschoten; and while the residents there were a pretty left-wing bunch too, it had little of the deep communist history of Finsterwolde or Beerta. 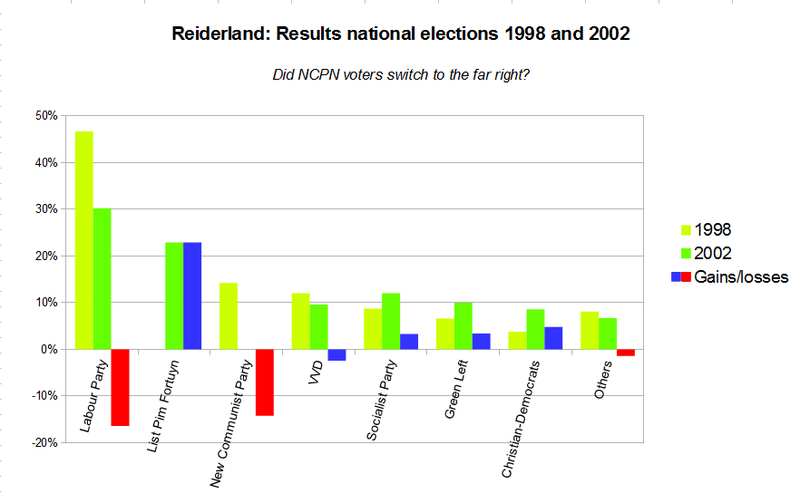 In fact, the NCPN had tried to relaunch in Winschoten as well in 1994, and gotten just 4% of the vote. And yet, once again, no death knell. In last year’s local elections, a grandly titled United Communist Party (which ran in only one other municipality in the country) doubled its number of seats and increased its vote share to an altogether decent 16.0%. They came in second only to the Socialist Party, which gives you an idea of how stubbornly leftist this area is. In the Finsterwolde and Beerta precincts, specifically, they got 33% of the vote. This year, the United Communists were so bold as to run in the provincial elections, so did their luck keep up? Interestingly enough, it didn’t. Not just did the party fail to make any impression province-wide, getting just 0.5% of the vote, it did horribly even in Oldambt, with just 4.1% of the vote. Even at the precincts in Finsterwolde and Beerta it remained stuck under 10% and 8%, respectively. How come? Did the Socialists sweep the municipality? United Communist Party posters at the former cultural center of Winschoten. Photo by ripperda, licensed under Creative Commons. This is where things take a curious turn. 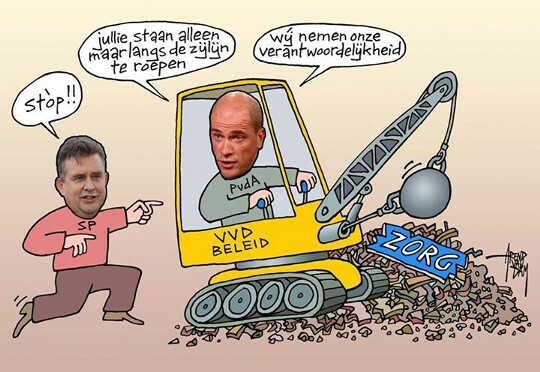 In my post last year about the local elections, I already recounted how the New Communist Party (NCPN) dropped the ball somewhat in the 2002 parliamentary elections — the year that Pim Fortuyn swept through the Dutch political landscape, and his anti-immigration, anti-EU, anti-Islam party went from zero to 17% of the vote practically overnight, in an election that took place just days after his assassination. In general, the northern provinces weren’t anywhere near as taken with his brand of politics as the rest of the country— in none of the four northernmost provinces did the List Pim Fortuyn (LPF) get over 12% of the vote. But there was an exception. That year, the NCPN had decided not to take part in the national elections, since it never made any mark in it anyway. Coincidentally or not, Reiderland promptly provided the best result for the LPF in the entire north. It seems like something similar might have happened this time, though it’s not entirely clear. The Freedom Party did not take part in the local elections last year, but it did take part now, and it received 11.6% of the vote in Oldambt. That was almost identical to its national score, but well above its score in the province of Groningen as a whole (8.0%). It was roughly in line, however, with what the party got in other municipalities in the eastern part of the province, which has been good to the Freedom Party in past elections as well. In fact, its best scores in the north came not in Oldambt but in neighbouring Pekela (18%), nearby Vlagtwedde (15%) and Emmen (15%), across the provincial border in Drenthe. And while the ‘united’ communists had recently expanded into Pekela, it wasn’t like there was a major chunk of communist voters in any of those places.